In Yumioka’s previous book, Kimono and the Colors of Japan, the kimono collector mainly introduced readers to the range of colors used in kimonos. 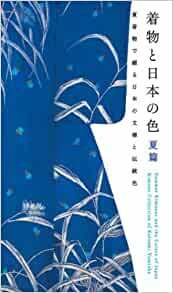 In this book; however, he has focused on the motifs employed in kimonos and obis (sash), with particular emphasis on the materials used in making summer kimonos. Recent summer kimonos have become relatively orthodox and somewhat lacking in creativity. Those who are familiar with these recent summer kimonos are thus in for a surprise with the kimonos they will find in this book. Patterns of flowers and grasses, insects, fish, shellfish, and Western landscapes, in addition to daring colors and delicate embroidery, have elevated these kimonos to the level of art. In the author’s view, these patterns and motifs provide a full display of a delicate sense of beauty and bold design, as well as the playful spirit and creativity with which the Japanese try to keep themselves cool and comfortable in the summer. Worth every asking price! Lots to learn about Kimonos and why they are soo beautiful! The author also share his passion of why he collects Kimonos in the first place! Which make it even more enjoyable! The color combo is great as well. Feast for the eyes! A less know Japanese art. I love it - the combination of colors, the unbalanced features of the artwork. If you love Japanese art, you will love this book. Gave this book as a Christmas present. The recipient loved it. 5つ星のうち5.0Hard not to lust after, once seen. This is the kind of book that, if you are an artist, you want to own. It has excellent examples of handcraft art that are very hard to find when you are looking for them. I used it to imagine the gradations in a two-dimensional flower to make it three-dimensional. Exquisite.